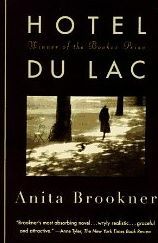 Hotel du Lac , by Anita Brookner surprised me. The first forty or so pages, while beautifully written, were a tad tough to meander through at times. But then, oh then, all of a sudden, and at some point I can't recall, I was quite happy -- it pulled me in and although it's a quiet and contemplative story, it was really quite interesting and I felt at home with it. Edith Hope is a romance writer who writes under another name -- she's accomplished, but to be honest, she writes about feelings and events that she's never sure she'll ever have, or at least have forever. She's withdrawn, and doesn't fit with her "friends." Edith is sent away from "civilized" society in London to a quaint and quiet hotel in Switzerland following a scandal that it has been deemed should not occur amongst polite and learned men and women. While there, she encounters a sad variety of characters that initially seem almost so uninteresting, that they are interesting. Eventually, you are drawn into each one, into their nuances, their sad or internally destructive personalities. While one character, Mrs. Pusey initially impresses upon Edith that she is kind and lovely, it soon becomes evident that she's really just lacking in the same things that most of the hotel guests are without as well -- after all, why are they all sequestered in this hotel, away from family and friends, during a quiet time of season? It seemed to be that they all were suffering in some way. Do not expect a flurry of events in the winner of the Man Booker Prize of 1984. Expect instead a quiet discussion, a studied review of a writer's perspective of those she meets and interacts with, amidst the background of an incredible hotel. There is not a hurry from one thing to another. It is a slow exercise of evaluation and word usage to describe each scene, moment, person. Could it be considered tedious and boring to some? Perhaps. Could it also be viewed as deceptively pleasing, slowly building the undercurrent of anticipation for something, something brilliant and cunning to breach the water line and unfold its secret? Yes. At times, it was a bit humorous, but I found it to be an overall sad book, about people who were sad and who either were forced to be in exile by others, or simply had nowhere else that they could go. It's an insightful and thoughtful novel on love, loss, and regret. Although I wouldn't recommend it for everyone, I would say that if you like a quiet novel that delivers an introspective view on one's own life, then this sad little beauty is a book for you. He was a man of few words, but those few words were judiciously selected, weighed for quality, and delivered with expertise. Edith, used to the ruminative monologues that most people consider to be adequate for the purposes of rational discourse, used, moreover, to concocting the cunning and even learned periods which the characters in her books so spontaneously uttered, leaned back in her chair and smiled. The sensation of being entertained by words was one which she encountered all too rarely. People expect writers to entertain them, she reflected. They consider that writers should be gratified simply by performing their task to the audience's satisfaction. Like sycophants at court in the Middle Ages, dwarves, jongleurs. And what about us? Nobody thinks about entertaining us. I look forward to reading more Anita Brookner novels. Particularly when I learned from Thomas at My Porch that Ms. Brookner is now in her eighties and has written a book a year since her first published fiction novel in her early fifties. Something about the way you describe this book vastly intrigues me. Maybe it is what you do not say about it that really piques my interest, or maybe it is the way that this book is so quiet and still, yet made such an impression on you. Whatever the case may be, I was very impressed with this review and am adding the book to my wish list right away!! I have to be in the right mood to read a slow, contemplative book like that. Great review! Sounds excellent. While I can get carried away by Harry Potter and the like, it's really quiet novels like this one that have my heart. It's on my list! I love the way you describe this and I'm definitely adding it to my list. I love it when a book unexpectedly hooks you! I haven't heard of this one before but I am looking forward to adding it to my list now! Excellent review and going to add Hotel du Lac to my TBR list next. I loved this book as well. I can still recall reading it on a beach in Aruba several years ago. Sometimes it's refreshing to read a book that isn't steeped in drama, but rather just a story. I might keep my eye out for a copy of this book. I really enjoyed it too. Like you said, it's not for everyone, but it is just a beautifully written book. This sounds wonderful and I think I must read it, though I do believe I will wait until after the holidays to be sad. I do need to be in the right frame of mind. I've been trying to avoid overly sad books lately, but this sounds interesting. Great review! I tried to read this when it first came out and then I abandoned it. My reading styles were different then and I do think it is one of those books that I need to come back too. I've read a number of her books, and some of them I find simply spectacular, while others I can't get into at all. So glad you enjoyed this. Brookner is indeed a remarkable writer. I want to read more of her work. I loved this book and I'm not kidding but after reading this one I've just bought several more of her books just because she wrote them. I think you said it perfectly - a studied review of perspectives. Wonderful review! If you get a chance I highly recommend Leaving Home. I have never heard of this writer but it sounds like a good read based on your review and that quote. Thanks. I've read a few of Anita Brookner's books and have enjoyed them. I find, however, if I read too many consecutively I get a wee bit depressed and head for something chirpier! A wonderful writer, though, and your excerpt is making me reach for her on my shelves. I wasn't a fan of this one. It was to meandering and nothing really happened. I agree that there were a lot of great quotes, but I like a bit of plot to pull me through. I'm glad it was short or I'd have never made it to the end! what a beautiful review! this sounds like such an introspective book that could almost be disturbing in its subtleness and quietness ~ I'm going to add it to my classics selection! Hmm... you, My Porch and Savidge Reads all recommending? Have to check this one out. Thanks for sharing! I used to love Anita Brookner and really enjoyed Hotel du Lac, but I haven't read any for years. I picked one up recently, and must get round to reading it. LOVE your lovely header and the whole new look! I have not read this author and I know I have wanted to do, but your review has had me interested. This sounds like such a lovely book; I feel bad that I haven't even heard of it until your review. You make me want to add it to my wish list immediately! Thanks so much for stopping by! Do let me know what you think if you get a chance to read this!